What would be a draft website without our own mock draft? 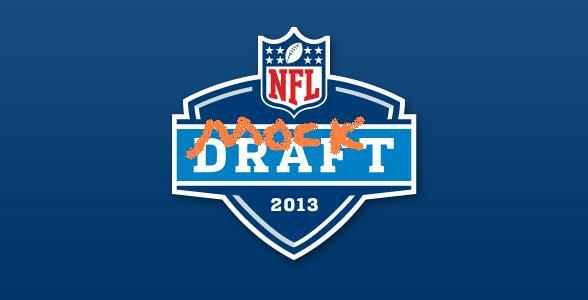 We try to stay away from having 5 mock drafts because we know how much could change. I will be the first to tell you that some of our ideas may come from some things we have heard from other people. But, with each pick we tried to think of what would be the best for them. If you read our thought process with most of the picks you can probably see that this draft has a lot of possibilities. Some of the guys we didn’t pick might not even go until the next round. Believe it or not, we didn’t share a lot of information with each other during the process. I think you find a difference on some picks and at times we seem to share the same brain. You’ll notice that neither one of us has Leon Sandcastle as a first round pick. Teddy- Eric Fisher, OT, Central Michigan. Fisher might be the most versatile of the premier tackles in this draft. I personally prefer Joekel because of the conference he played in. This is splitting hairs however. Considering the Chiefs still have Albert on their roster and Fisher can move to RT if needed, this pick makes the most sense. Teddy – Dion Jordan , DE/OLB, Oregon. With this pick the Jags could design an entire defense around Jordan. I may agree that Jordan might have a bit of a “bust” potential, but this guy has definite speed and agility to attack the ball carrier and rush the passer. He gets into some trouble if you use his speed against him, but he will run across the field to make plays on the other side. He’s definitely a guy you have to account for. Dwayne – Luke Joeckel, OT, Texas A&M. The Jaguars have a lot of needs, which is why they are drafting #2. They need help at quarterback, offensive line and pretty much anywhere on defense. I could see them possibly trying to make a big splash and drafting Geno Smith. There is new ownership, attendance is way down and this staff isn’t committed to Blaine Gabbert at QB. I think ultimately it’s a little high for Smith. I don’t think they can pass up on the best player on the board who just so happens to be at a position of need. If they decide to take a QB, they could always go that way with pick 33 in the second round. Teddy – Luke Joekel,OT,Texas A&M. Without Al Davis to draft a track guy this year, the Raiders actually get the best player in the draft. This will open up a lot of things for the offense. Joekel can flourish in a run heavy offense which would be good news for RB Darren McFadden. Oakland may want to trade back and accumulate picks because virtually anyone they draft in the first 4 rounds could be a starter. This roster is pretty bad. Dwayne – Sharrif Floyd, DT, Florida. The Raiders could go a couple of ways here. Their defense is in bad shape. Most of it looks like an expansion team. As long as they draft a productive player they can’t go wrong. They could go with the best corner in Dee Milliner, but it’s my belief that you build a team with a strong line, so the Raiders go with the best defensive lineman in the draft. Teddy – Lane Johnson, OT, Oklahoma. I was going back and forth between Star Lotulelei and Johnson here. Should the Eagles settle for the third best at a position here, or take the best defensive tackle in the draft? In the end, Johnson has great feet and I think new Eagles coach Chip Kelly can design a lot of fun things here. Too early for Geno Smith in my book. Dwayne – Dion Jordan, OLB, Oregon. The Eagles have needs at quarterback, offensive tackle and corner. They have Trent Cole who is a former defensive end playing one outside linebacker spot and Connor Barwin was signed as a free agent for the other spot. Jordan is a player that Chip Kelly is very familiar with and gives them more flexibility in their conversion to the 3-4. If Cole can’t make the conversion, Jordan can step right in and take over. He can also help during teach the defense to the rest of the defensive players. Teddy – Ziggy Ansah, DE, BYU. Ansah would be a strong possibility especially after losing Cliff Avril in Free Agency. There are lots of concerns about Ansah’s experience, but his athletic ability shows up on tape. He plays with a lot of speed and tenacity. Dwayne – Dee Milliner, CB, Alabama. Most mocks have Ziggy Ansah here. I believe he’s too much of a risk to take this high. He is crazy athletic, but extremely raw. I want to see more production to spend the fifth overall pick on him. Milliner is the best corner in the draft and the Lions have needed a corner for a while now. Teddy – Dee Milliner, CB, Alabama. The other half of Draft Maniacs, Dwayne, thinks Geno Smith may go here. This is a good guess considering Cleveland’s biggest hole may be at QB. I think Milliner along with Haden could give the defense a lot of options for the new coach. There are some things I don’t like about Milliner, but the recent attack about his medical history seems unfair. His toughness is evident on tape and he has only missed one start his entire college career. Dwayne – Geno Smith, QB, West Virginia. The Browns have watched their two biggest needs filled right before their pick. The options at pick 6 are to upgrade the guard spot or quarterback. With new ownership, general manager and coaches, no one is married to Brandon Weeden. They do not have a second round pick, so the Browns decide to get a new QB to grow with the new coaching staff. Teddy – Star Lotulelei , DT, Utah. The Cardinals have to be a little upset that one of the OTs didn’t fall to them here. But, they will get the best DT in the draft. All of a sudden, the Cardinals DL looks pretty formidable. I also just could not pull the trigger at QB here. The Cards will give Palmer a year to prove he is a complete disappointment. Dwayne– Lane Johnson, OT, Oklahoma. The Cards had two big needs going into the offseason. They traded for Carson Palmer to address one of their needs. Now they need to protect him and they can’t believe their fortune that Johnson is still available. They sprint to the podium to turn in the card! Teddy – Chance Warmack, G, Alabama. As you may know Bills new head coach Doug Marrone was the head coach of QB Ryan Nassib in Syracuse. Many people are connecting the dots and believe he will draft his man at this pick even if it may be a round early. I realize the stars may be aligning perfectly here, but I’m not into horoscopes. Warmack is the best player left on the board and could make up for losing Andy Levitre in Free Agency. Teddy – Barkevious Mingo, OLB, LSU. This pick was hard, because I wanted to give them FSU CB Xavier Rhodes here since they recently traded the disgruntled Darrelle Revis. But, if ever a Rex Ryan OLB/DE played in this draft then it is this guy. They also have a pick at 13 that they could address CB with. Dwayne – Barkevious Mingo, OLB, LSU. The Jets need a pass rusher. Mingo played defensive end at LSU, but he has a thin frame. He is more suited for a 3-4 outside linebacker. Rex Ryan gets a guy that can get after the passer to help his defense. Teddy – DJ Hayden, CB, Houston. I considered WR Tavon Austin at this spot, but CB, DE, and OG are the biggest needs here. I could see them going Jonathan Cooper, but I’m not sure that fits this scheme. CB may be just as big of a need and Hayden could be the right man for the job. Titan fans will love watching this guy play. Dwayne – Johnathan Cooper, G, North Carolina. The Titans signed Andy Levitre in free agency, but they have to deal with J.J. Watt twice a year. They need all the interior help they can get and Robert Turner is not the answer at right guard. Cooper gives them an upgrade on the offensive line and helps Chris Johnson and the running game, also taking the pressure off Jake Locker. Teddy – Jonathan Cooper, G, North Carolina. This seems to be a popular pick at this spot. At this point I actually think Floyd or Cooper are the best two players left on the board. I’ll just stick with the status quo and go guard here. Cooper may be the most athletic guard that has come out in a long time. Dwayne – Star Lotulelei, DT, Utah. The Chargers need O-line help desperately and the top 5 offensive linemen have already been taken. They could have decided to upgrade the corner position, but decide to draft the massive defensive tackle and plug him in at the nose position. Teddy – DJ Fluker, OT, Alabama. I think the Dolphins are going to be so desperate to have a OT that they may reach and go for Fluker. While he certainly looks the part, Fluker may struggle with speed rushers. The good news is that the Dolphins may be able to move him inside if he struggles. Too rich for my blood, but this is a premier position in this league. Dwayne – Xavier Rhodes, CB, Florida State. The Dolphins needed an offensive tackle, but could not trade up in front of Arizona. Another of their needs is at corner and Rhodes makes sense at this spot. They traded away Vontae Davis and lost Sean Smith to free agency, so Rhodes addresses another big need. Teddy – Tavon Austin, WR, West Virginia. One of the problems with the Jets’ offense, besides Mark Sanchez, is they don’t have anybody that scares a defense. I agree with the assessment that they had to claw and fight for every yard last season. Austin’s speed and athleticism are unmatched in this draft. He instantly makes this offense scary. Also, even Sanchez and Tebow can throw the ball to this guy on bubble screens. Look for him to be active on special teams too. Dwayne – Tavon Austin, WR, West Virginia. Thanks to the trade of Darrelle Revis, the Jets get a second high first round pick. They addressed the pass rush with the first pick. Now, they decide to go for the most explosive player in the draft. Austin is a big play threat that should help the Jets’ offense and return game immediately. Teddy – Shariff Floyd, DT, Florida. I’m not as high on Floyd as Dwayne is. However, once you get him outside the top 10, I no longer have the same concerns about him I did as a top 3 pick. He has a great burst off the line. I’m a little worried about his production, but he is definitely battle tested. His falls stops here. Dwayne – Ziggy Ansah, DE, BYU. Ansah has been in the top 5 of most mocks, but when he falls to Carolina, they can’t resist the temptation. Ansah is an athletic freak, but he is raw. He won’t be forced onto the field early in Carolina, so he will have a chance to develop. He can be used in special packages until he is ready to start. Teddy – Cordalle Patterson , WR, Tennessee. It has been a pretty chic pick to put Jarvis Jones here, but I think the Saints would have picked Austin if he was still here. Considering the safety position is pretty deep this year, I think the Saints can wait for this position and pass on Vacarro. Also, Sean Peyton has been away from football for a full year. You know he is drafting something to make the offense better. Dwayne – Jarvis Jones, OLB, Georgia. The Saints are converting to a 3-4 defense under Rob Ryan. They need pass rushers. Jones is a playmaker that if the doctors pass him medically should give the Saints a force off the edge. Teddy – Kenny Vacarro, S, Texas. The Rams have to be upset that they lost out on the two highest WR prospects, but keep in mind teams know they will have to trade ahead of the Rams to get their WR. They also had problems in the backend in coverage last season. Vacarro may be the best cover safety in the draft. He struggles in run defense, but he can definitely cover a WR in the slot. Dwayne – Kenny Vaccaro, S, Texas. The Rams need a wide receiver really badly and they had to be heartbroken that Austin is gone. They also need a running back, but it’s too high for Eddie Lacy here. They decide to go with the highest ranked player at one of their needs. Teddy – Jarvis Jones, OLB, Georgia. This was the guy everyone thought would be going to New Orleans. I think Jones is one of the most explosive players on defense. He has had question marks about his speed, but he is definitely a top half of the first round kind of player. The Steelers jumping on players that slide is simply the Steeler way. Dwayne – Tyler Eifert, TE, Notre Dame. Heath Miller is recovering from ACL surgery and may not be ready early in the season. If he is ready, Eifert gives Big Ben a 1-2 punch at tight end similar to what the Patriots do with Gronkowski and Hernandez. Teddy – Sheldon Richardson, DT, Missouri. The Cowboys really need help on the OL, but the top 6 players are gone. I don’t think Bjoern Warner will be much of a consideration here, and the only outside the box player I can think of would be Tyler Eifert. But with this big body still on the board, the Cowboys will definitely help out a DL that is switching back to the 4-3. Monte Kiffin will be thrilled if he isn’t taking a nap. Dwayne – D.J. Fluker, OT, Alabama. The Cowboys have to be upset that the top 5 offensive linemen are gone. They could attempt to shore up defensive tackle here, but Fluker can help protect Romo and that new expensive contract. Fluker could compete with Doug Free at right tackle or he could possibly move inside to guard. Teddy – Tank Carradine, DE, Florida State. The draft process really is silly. A few months ago Bjorn Werner would have been a consensus top 10 pick. However, they have poked and prodded him enough to move him down in the draft. I may be in the minority, but I am actually a bigger fan of Carradine than Werner. Carradine is still developing, but I think the Giants will recognize the value they may have with him. The Giants have always valued pass rush and this will be a good spot to replenish the talent. Dwayne – Manti Te’o, MLB, Notre Dame. The Giants need linebackers. Mathias Kiwanuka is probably moving back to defensive end. They have Dan Connor penciled it as the middle linebacker, but he could slide over to the strong side if needed. Of course, there is always the question of how much Connor still has left in the tank, so the Giants may not be through drafting linebackers. Teddy – Sylvester Williams, DT, North Carolina. Williams is a powerful person up in the middle that does not get pushed around. If Williams gets past Dallas, Chicago may run to the podium to make the selection. The Bears may also consider ILB or CB here. Dwayne – Alec Ogletree, LB, Georgia. Now that Brian Urlacher is gone, the Bears have to find someone to replace him. The Bears signed DJ Williams, so he and Ogletree could be the starters along with Lance Briggs. Ogletree gives them the flexibility to either play in the middle or on the strong side. Teddy – Menelik Watson, OT, Florida State. Once again these OTs will get pushed up into the first round. Don’t be surprised if the Bengals draft Xavier Rhodes or even RB Eddie Lacy here. While many people believe many of Dalton’s sacks were his own fault, giving Dalton a few extra seconds to look for AJ Green would be a great idea. Dwayne – Justin Pugh, G/T, Syracuse. Pugh is a versatile lineman that can play guard or tackle. If they don’t resign Andre Smith, he could play right tackle. If not, he can slide inside to guard. Teddy – Tyler Eifert, TE, Notre Dame. I know they have a capable TE already, but keep in mind Dallas may be considering Eifert and they have a pretty good TE on the roster too. St. Louis needs to get Bradford as many weapons as they can. Eifert might also be one of the best players left on the board. Dwayne – Cordarrelle Patterson, WR, Tennessee. This is a pick the Rams got from Washington to trade up and get RG3 last year. The Rams passed on Patterson when they drafted Vaccaro. Now, as they get on the clock again, he’s still there. Needing a receiver, the Rams pull the trigger this time. Dwayne – Sylvester Williams, DT, North Carolina. His last name is Williams, so he has to play defensive tackle for the Vikings, right? Sylvester should be able to start right away alongside Kevin Williams at defensive tackle. Teddy – Bjoern Werner, DE, Florida State. Werner’s free fall is over. I think they take him even though a pretty good CB is left on the board in Rhodes. Indianapolis will most likely continue to look defense for the rest of the draft. Although I’m not impressed with Werner’s effort during a full four quarters, I think he definitely has a lot of talent. If they can “coach ‘em up” this will be a great pick. Dwayne – Kyle Long, G/T, Oregon. The Colts go as Andrew Luck goes. Luck was under pressure way too much last year. Whether Long ends up as a guard or tackle, he should be able to give Luck more time to throw. Teddy – Xavier Rhodes, CB, Florida State. It isn’t uncommon for CBs to fall in the draft, just ask Prince Amukamara a few years ago. Rhodes does great in man to man coverage. While he grabs and gets a few penalties here and there, he doesn’t give up. He could play a little better in the running game. But, I think Minnesota has to be happy about this value. Minnesota looks long and hard at Manti Te’o here. Dwayne – D.J. Hayden, CB, Houston. The Vikings have a couple of needs after addressing the defensive line with their first pick. The Vikings lost receiver Percy Harvin and corner Antoine Winfield in the offseason. They need this pick to solidify one of the positions and Hayden is the best available player at this point of the draft. Teddy – Datone Jones, DE, UCLA. This is a player I actually like a lot. This guy played all over the field and seemed to always give his best effort. Green Bay does not like to pay money to free agents, so look for them to start creating competition on the defensive line. Dwayne – Eddie Lacy, RB, Alabama. This could be scary. If a defense sits back to protect against Aaron Rodgers, then Lacy would be breathing right down their neck. The defense will have to decide if they want to die fast or die slow. Teddy – De Andre Hopkins, WR, Clemson. I love this kid. He isn’t the fastest, but he sure does know how to get open. He knows and understands coverage and plays hard to the whistle. The Texans spent a few picks at WR last year, but since AJ is asking for a WR I am guessing he wasn’t impressed. This would be a guy AJ would love to play alongside. I don’t know what Dwayne thinks about this, but I’d actually be jealous of this pick. Dwayne – Robert Woods, WR, USC. The Texans top two needs are a receiver to complement Andre Johnson and a right tackle. The choice here is between Woods and Menelik Watson. Woods barely edges out Watson as a bigger need since Kevin Walter is no longer with the team and DeVier Posey suffered an Achilles injury in the playoff loss to the Patriots. Teddy – Eric Reid, S, LSU. Denver could go in a few directions here. I am tempted to just give them the best safety available. I think Elam is also a possibility here. They could also give Te’o or ILB Kevin Minter a look here. I don’t think anyone would take DE Margus Hunt in the first round. Personally, I wouldn’t take Hunt in the 2nd either. Dwayne – Bjoern Werner, DE, Florida State. The Broncos have replaced their fax machine after losing Elvis Dumervil. So now they need to get the replacement for Dumervil and Werner is it. He has a good motor and should terrorize quarterbacks for several years. Teddy – Desmond Trufant, CB, Washington. There is no way this pick is going to be right. If I knew what the Patriots were thinking on draft day, I may already be a scout for an NFL team. But, I will say that trying to trade for Emmanuel Sanders makes me think they do not like WR here. As complicated as their offense is, I don’t think a WR would make an impact with them at this point in the draft. Dwayne – Here’s my shocker. The Patriots are known to move up and down in the draft. They normally have more draft picks than anyone else. This year they are missing picks in rounds 4, 5 and 6. They are probably looking to trade down. So, I’m predicting the Eagles trade up here to get Florida State QB E.J. Manuel to run the Chip Kelly offense. As many hits as Mike Vick takes, the Eagles need someone to be ready when Vick gets hurt. Teddy – Terron Armstead, OT, Arkansas Pine Buff. Arkansas Pine Bluff? Yes, this would be the 5th tackle taken in the draft if you are counting. Still no QB or RB yet. I don’t think that is beyond reason here. Armstead would be a good fit for the Falcons if they pass on RB Eddie Lacy. Dwayne – Desmond Trufant, CB, Washington. The Falcons could have been looking at Kevin Minter to upgrade the middle linebacker, but they lost Dunta Robinson and Brent Grimes in the off season. The need to replace them drives this pick. Teddy – Matt Elam, S, Florida. Watch Harbaugh do something silly and draft Nassib or Geno Smith here. San Fran has an obvious need at safety. But this team has so little holes and many draft picks left to work with that they really can draft the best player left. I have seen Jesse Williams from Alabama being drafted here a lot in other mock drafts. Teddy – Manti Te’o, ILB, Notre Dame. I could write a book about this guy. Yes, the fake girlfriend would be spectacle. But, this would be the Ozzie Newsome way to pick the best player left on the board that fell down to 32. He would have big shoes to fill with Ray Lewis gone, and he really isn’t a thumper of a LB like Lewis was. However, Haloti Ngata will keep him clean from debris and allow him to make plays. I think he will have a great career. Dwayne – Kevin Minter, ILB, LSU. The Super Bowl champs could go a couple of ways here. Their two biggest needs are at inside linebacker and safety, so they could be looking at Matt Elam. However, Rolando McClain, who was signed in free agency to strengthen the middle, was arrested this week. Minter would likely be the bigger need of the two players. There you have it. I hope this was a different mock draft than some of the ones that are out there for you to look at. Teddy did not have a QB or a RB go in the first round and Dwayne had 2 QB;s and 1 RB. We will know what happens soon. This entry was posted on April 25, 2013 by draftmaniacs in Uncategorized and tagged 2013 NFL Draft, 2013 NFL Mock Draft, 2013 NFLDraft, Mock Draft, NFL, NFL Draft.